Recently, the Zetas have indicated that the severe wobble which may be caused by the World Council, can already potentially cause flooding in Germany. Can the Zetas tell us more about what could happen to coastlines during this possible event (possible wave height and etc)? And generally what to expect? Of course Zetas from the beginning said that coastal areas are not safe, but possible explosive rate of wobble make people more unprepared. Will it have an explosive or fast growing rate? I just read recent ZT regarding the severe wobble and flooding but it only says that parts of Europe might be flooded. What about the East Coast? I live in New York City. Will it also get flooded when the Council of Worlds creates the severe wobble so that Dunford can cancel the elections? How can he cancel the elections if only Europe is afflicted and not the US? Will this severe wobble occur before or after the announcement re Nibiru? Triggered a series of devastating tsunamis along the coasts of most landmasses bordering the Indian Ocean, killing 230,000 people in 14 countries, and inundating coastal communities with waves up to 30 metres (100 ft) high. Scientists investigating the damage in Aceh found evidence that the wave reached a height of 24 metres (80 ft) when coming ashore along large stretches of the coastline, rising to 30 metres (100 ft) in some areas when traveling inland. The very high fatality in the area is mainly due to the unpreparedness of the population from such an event. Helicopter survey showed entire settlements virtually destroyed with destruction miles inland with only some mosques left standing, which provided refuge for the people from the tsunami. and that the Pole Shift tides can be expected to be 500-600 feet high. In both cases, the higher tide is a result of tidal bore, the geology of the coastline, where water is funneled upward as it has nowhere else to go. Nibiru pulls to the right of the Earth steadily and the Earth and her sister planets (Venus and the Dark Twin) squeeze to the left. The Pole Shift is unleashed when Venus and the Dark Twin escape the cup, allowing Nibiru to draw closer to the Earth, but for a severe wobble these extreme positions are not in place. Nibiru is still not directly to the right of the Earth, nor is it close. Thus the severe wobble is a COMBINATION of a swing to the left into a lean to the left and back again, and a swing of the N Pole away into extreme darkness for the Northern Hemisphere and then back again. It will not reach the extremes that we have described for the Last Weeks. Nevertheless, it will be extreme enough that the entire population of the World will notice that something is amiss, the Sun very much out of place, and the establishment will not be able to sputter excuses fast enough. The people will know that the establishment is lying, and any such lies will doom the establishment to becoming a hollow voice no longer believed on any matter. and 200 feet above sea level to evade the Pole Shift sloshing. One could assume this to be approximately half that for a severe wobble, thus being 50 miles inland and 100 feet above sea level should suffice. However, local variances will exist, causing tidal bore, causing the tide to roll further inland before stopping, and caution would of course be better than not. We have described the severe wobble as likely to commence SUDDENLY, without warning, so our advice for those likely to be affected is to sleep on the roof, or above ground, or be prepared to move if alarms are sounded. as an example of a flood tide rolling inland. The elephants knew, and took to the hills, but mankind does not listen well. It should be noted that we described the effect of a severe wobble back in 2011, and 5 years have passed since that time. A severe wobble was always in the cards, for mankind, for the Earth. We also described devastating tides as a result of 7 of 10 plate movements, particularly against Europe. in that mankind will move away from the coastlines. Planet X is approaching mainly from the right, in its retrograde orbit, though also somewhat Sunside on its way outbound from the Sun. The severe wobble will merely be an exaggeration of the existing wobble, where the magnetic N Pole is pushed as its current location in the Arctic near Siberia rolls over the horizon. As the globe is pushed violently northward, the waters in the Pacific will slosh southward, and waters in the Atlantic will slosh in the opposite direction, northward. For the Pacific, the northern coastlines will be pushed under the ocean, and for the Atlantic, the southern coastlines will be pushed under the ocean. Then, 12 hours later, this reverses. The sloshing will be in a N/S direction, back and froth. The severe wobble slosh will be 200-300 feet high. Visibility is enhanced, and Second Sun sightings are common. It is no longer an issue of the Earth wobble or temporary leans to the left of into opposition sufficing. This is twitching about, compared to the last weeks. If the years and months of the Earth wobble were the wrestlers positioning themselves at the edge of the mat, then the last weeks are full contact, and neither can let go of the other. When Venus and the Dark Twin escape from the cup, the particle crowding is suddenly eased, allowing Planet X to come forward toward the Earth. The Earth's first evasion is to tilt her N Pole away from the oncoming Planet X to such a degree, and so violently, that she leans all the way over to the left and then rebounds as a reaction all the way to the right. This is the severe wobble, for a length of 9 days. This is a flood tide, with the lip of the water being its highest point, rising like a silent tide endlessly on the rise, the wave rolling inland without a crashing back and forth, just a steady progressive inundation. To those at the mercy of such a flood tide, their first thought is to climb above the tide. Soon they are standing on the highest point they can reach, and still the water, flowing inland steadily, rises. Afloat on a boat or flotsam, they will be dragged inland with the flow until a reverse slosh begins, the water flowing back into its bed but in the nature of water during a slosh, overshooting this other side so that both sides of the ocean experience this flood tide, alternately, for some days until the momentum diminishes. When the flood tide recedes, those afloat are in danger of being dragged far out to sea with the flow, as the water will rush to its bed unevenly, more rapidly where it can recede the fastest. Our advice to be 100 miles from a coastline and 200 feet above sea level to avoid the coastal tidal waves during the pole shift should be applied. The tides during the Pole Shift will rise 500-600 feet along coastlines, not crashing down but steadily pushing inland. The eddy flow created by particles flowing coming from the Sun and thence around the sides of Planet X trapped Earth in her stalled orbit, and held her there in front of Planet X, no escape. As Planet X proceeded past the Sun's S Pole in his sling orbit, he went within the orbit of Venus, and thus likewise trapped Venus in this eddy flow cup when she came round in her orbit to encounter Planet X. The Earth's dark twin, sharing an orbit with Earth, joined this group of trapped planets within months, remaining behind the Earth, likewise stalled in their shared orbit, a dark hunk of black rock reflecting little light and thus essentially invisible to man. The severe wobble will also create tides that will assault coastlines in predictable places. Follow where the ocean currents go today, and exacerbate them to get an idea of what areas might be hit. This is not altogether a curse, but a blessing, as residents on those coastlines will have moved inland prior to the pole shift, For them, a life saving manoeuvre. France can anticipate a tsunami of 100 feet, Spain perhaps 30-40 feet, the UK 200-300 feet, and Norway 50-75 feet. The full brunt of the tsunami that strikes the UK will also wash through the English Channel, entering the North Sea, and clashing with the any flow coming down from the Norwegian Sea. The lowlands in the North Sea can expect a tsunami an estimated 100 foot high. 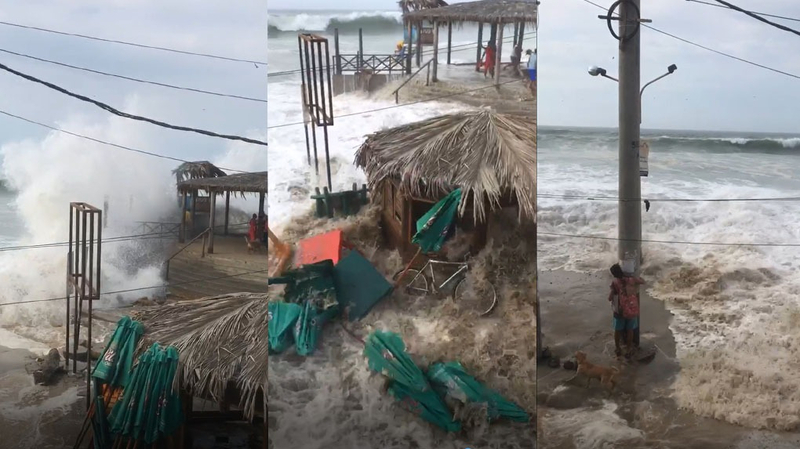 In two separate but dramatic incidents, huge waves hit coastal Peru and Cuba on December 21-22, 2018, causing damage and triggering evacuations in both countries. The same ‘enormous wave’ phenomenon was also reported in Ecuador, Panama Colombia and Florida. Weird no? giant waves engulf coastal Peru and Cuba triggering flooding and damage. Dozens of holiday makers had the fear of their lives as anomalous and enormous wavessuddenly engulfed several coastal cities near Mancora, in the region of Piura, Peru, on December 22, 2018. Police started evacuating the resorts when the large waves started flooding shops and restaurants along the coast. Strong winds coming from the southern United States caused waves and sea penetration in western Cuba, with flooding in low-lying urban areas of Havana on December 21, 2018. There were no reports of casualties, but damage linked to flooding. This is interesting considering the different places flooded by giant waves in recent days… As well as the volcanic tsunami in Indonesia. Five people are feared dead after a tsunami crashed through an Indonesian coastal city demolishing houses and leaving families missing. A 6.1 magnitude quake hit Indonesia's densely populated Sulawesi region on Friday morning, quickly followed by even fiercer 7.5 magnitude tremors which caused the tidal wave. The National Disaster Mitigation Agency has warned that initial reports show 'victims died in the rubble of a collapsed building'. Dramatic video footage filmed from the top floor of a parking ramp spiral in Palu and posted on Twitter, showed a churning wall of whitewater flatten a large mosque. Houses have been swept away and people reported missing as the waves struck Palu and another city, Donggala - Indonesian disaster agency spokesman Sutopo Purwo Nugroho confirmed. Sutopo said communications with the area in central Sulawesi are down and the search and rescue effort is being hampered by darkness. There were no immediate reports of deaths or injuries after the latest tremor, but it was a higher magnitude than a series of quakes that killed hundreds on the island of Lombok this summer. The Indonesian government caused widespread confusion after issuing a tsunami alert on Friday afternoon, then quickly repealing at 5pm despite the tremors. Three hours later at 8pm local time a spokesman for Indonesia's geophysics agency confirmed that a tsunami had in fact occurred. People in Central Sulawesi and West Sulawesi provinces were only then told to evacuate to higher ground. It remains unclear as to whether people remained in their homes because of the contradicting government advice. 'There are reports that many buildings collapsed in the earthquake,' Nugroho said in a statement. Monstrous waves invade the Bahamas. Strong waves also registered today in Colombian Coasts. The largest swell in more than a decade just hit Puerto Rico. The Tallest waves measured 30 feet, more than what Hurricane Maria caused. The people from Puerto Rico say they either ignored the warnings or thought it wouldn't be as bad as the Hurricane. Roads were shut down and schools were closed. Bulge of Brazil wobble sloshing is happening in Caiçara / Rio Grande do Norte. The Sea has advanced and is destroying everything in its path. At night The sea entering the last trolly area in San Juan PR as if it were a mini tsunami.